Last week on Agents of S.H.I.E.L.D., the series managed to weave a complex narrative of interlocking stories, each charging toward the season 3 finale and eventual showdown between Phil Coulson's S.H.I.E.L.D. and Hive's Inhuman army. While Coulson, Lincoln, and May attempted to track down Daisy -- who defected to Hive's army after being infected by his Inhuman powers -- Fitz, Simmons, and Mack searched for answers to reversing Hive's control on Inhumans. In this week's episode, 'Failed Experiments,' written by Brent Fletcher and directed by Wendey Stanzler, Hive sets out to remake the Kree experiments that created the first Inhumans. To do so, Hive must obtain Kree blood from a living member of the species, and he summons Kree Reapers to Earth. Meanwhile, Mack and May lead a team on a mission to kill Hive, and back at the S.H.I.E.L.D. headquarters Lincoln becomes a test subject for Fitz and Simmons' Hive anti-toxin. 'Failed Experiments' doesn't have the visual mastery of recent Agents of S.H.I.E.L.D. episodes like 'Spacetime,' nor the intriguing mystery of 'The Team,' but the episode does capitalize on some of the show's strongest components: compelling characters, developed relationships, and Marvel Cinematic Universe mythology. Although many of the agents are still reeling from the loss of Daisy to Hive -- with many taking the blame on their own shoulders, while May is justifiably annoyed by everyone making the situation about themselves -- Lincoln's grief is compounded by being benched from field work and forced to stay at S.H.I.E.L.D. headquarters. In an attempt to make himself useful, he volunteers to be the lab rat for FitzSimmons' Hive anti-toxin. However, when the anti-toxin is deemed too dangerous, Lincoln goes behind the backs of his fellow agents and injects himself. Although the anti-toxin is eventually found to be ineffective, this storyline is effective in continuing Lincoln's ongoing struggle between his loyalty to Daisy and his loyalty to S.H.I.E.L.D. -- the former of which he usually prioritizes over the latter. With Daisy seemingly gone while she's under the influence of Hive, it appears Lincoln is becoming destructive, first putting his team at risk in the previous episode and now completely ignoring the potential dangers of the anti-toxin (despite his history as a doctor) in an entirely self-destructive and largely selfish move. 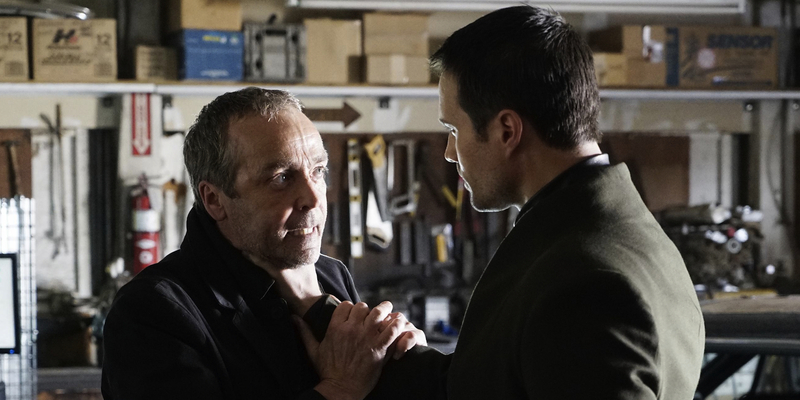 Although these emotionally charged decisions might make sense on paper within the context of Agents of S.H.I.E.L.D., the development of Lincoln has not fully earned the emotional buildup of this particular storyline in 'Failed Experiments' -- nor, likely, the payoff it is building toward at the end of this season. Agents of S.H.I.E.L.D. took somewhat of a step backward in terms of its Marvel Comics characters in 'Failed Experiments' by introducing two unnamed Kree reapers that spend most of their time on screen killing Inhumans -- like the always-the-sidekick Inhuman Alisha (Alicia Vela-Bailey) -- and proclaiming Hive to be a "failed experiment." After the better developed and complex villains recently featured on Agents of S.H.I.E.L.D., including Gideon Malick, Hive, Grant Ward, and Jiaying, the sudden appearance and subsequent deaths of the Kree reapers feels more akin to the show's first season (prior to the Captain America: The Winter Soldier tie-in episode) than the level it has operated on for most of season 3. Additionally, since their appearance is rendered entirely pointless by the end of the episode when Daisy declares her blood can be used to recreate the experiments done by the Kree -- a twist that will have more emotional consequences than the sacrifice of the two Kree reapers -- Agents of S.H.I.E.L.D. 's extraterrestrial visitors give off the feel of MCU connections simply for the sake of connection. However, with Marvel Studios' shelving the Inhumans movie that was planned for release in 2019, perhaps the brief appearance of the Kree in Agents of S.H.I.E.L.D., and their involvement in the history of the Inhumans, will lead to a more compelling storyline in the show's fourth season. While the appearance of the Kree and Lincoln's experience as an anti-toxin test subject weren't necessarily comparable to the storytelling in recent episodes of Agents of S.H.I.E.L.D., the showdown between Daisy and Mack managed to elevate 'Failed Experiments' to the show's usual level. Building off the partnership between Mack and Daisy since the beginning of season 3, as well as Mack's reluctant acceptance of Inhumas thanks to Daisy's education, 'Failed Experiments' saw their friendship and partnership pushed to its breaking point in what is perhaps the best scene of emotional conflict on this show to date. In the episode, both Daisy and Mack wish to save the other, but Daisy wishes to do so by turning Mack into an Inhuman and Mack wants to bring Daisy back into the fold at S.H.I.E.L.D. Both characters want the same thing -- to save their partner -- but their beliefs in how to manage such a feat are fundamentally at odds, giving the conflict between Mack and Daisy an emotional weight earned by the entire development of their relationship up to this point. As a result, the payoff of Mack and Daisy's confrontation helps to ground the less well-developed aspects of 'Failed Experiments' in the emotional heart that has become the most important strength of Agents of S.H.I.E.L.D. Hive managed to deliver a couple nods to Captain America: Civil War with references to billionaires and their iron suits, the military and the super soldiers, as well as this line: "That fear bred paranoia which led to civil war." But these won't be the show's only references to Captain America and Iron Man's showdown since Civil War will have an additional impact on Agents of S.H.I.E.L.D. in the coming episodes. After the near-deaths of both Mack and Lincoln in 'Failed Experiments,' are they less likely to be the "Fallen Agent" foretold to die before the end of Agents of S.H.I.E.L.D. season 3? Or are their paths leading them even closer to becoming the fallen agent? Share your thoughts on the episode and theories about what’s to come leading into the season finale in the comments section!